In the Invoices section on the JGID dashboard left side, you have a colour-coded preview summary of the invoices you are working with, each categorized in accordance with its progress stage – either Draft or Pending or Overdue. The Draft status of an invoice means that you are currently working with the document and it is not completed. The Invoiced status refers to the Invoice being completed and sent or ready to be sent to the Client. The Overdue status of the Invoice refers to the fact that the payment term has not been met and the Invoice is currently due. 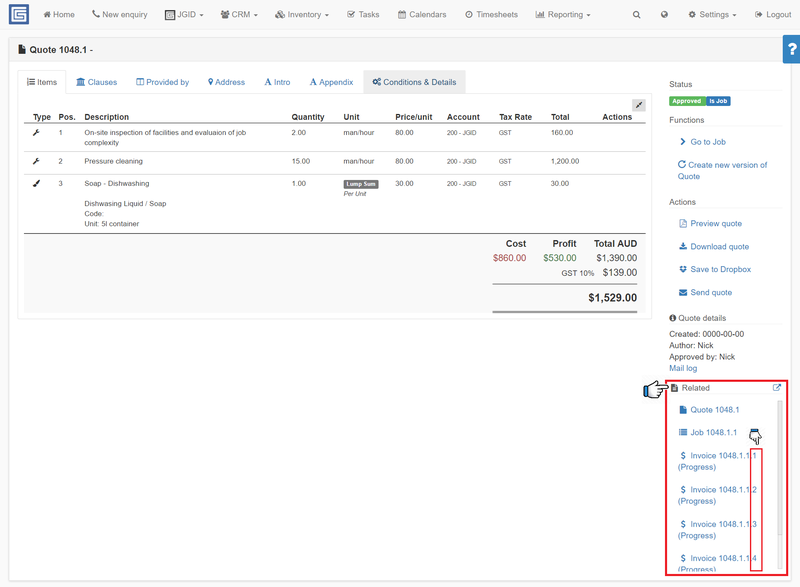 The Paid Invoices are not listed into the sumary preview section on the dashboard, because they are into the JGID data base, but yet they do not need to be monitored since they are duly paid. The focus is drawn to the documents that still need to be managed. So how does JGID help you do that? 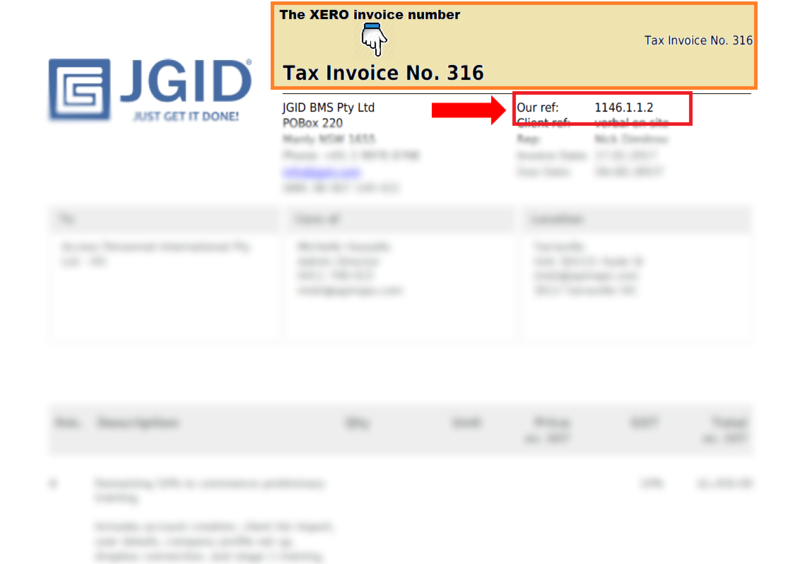 When you want to change an Invoice, bear in mind that if you use the Xero API integration feature to get your invoices pushed into Xero from JGID, the moment you change the status of the Invoice from draft to invoiced, by clicking on the Invoice complete button in the Command menu, on the right side of the screen, the Invoice will be sent to your Xero account either into the “Awaiting apporoval” list or the “Awaiting payment” list, depending on the configuration settings you have selected for your Xero integration form the JGID Add-Ons menu. Once this is done your Invoice will be assigned a unique Xero index number which will be the Invoice number used for accounting purposes and the account number which your clients will see when you send them the invoice. The first X number after the 4 X digit group is the Quote number out of which the Job has been generated, which in its turn is assigned the second X digit after the 4 X digit group. Then we finally come to the third X number after the 4 X digit group, which is the number of the version of the Invoice generated for the particular document. To summarize,if you have an invoice with a JGID reference number (“Our Ref. number”) 1221.2.3.6 would essentially mean that this is the 6th invoice, issued out of Job instance or repetition number 3, which was created out of the approved Quote version 2 from the Opportunity numbered 1221. Every time you create a version of a documen being either a Quote or a Job or an Invoice you are generated unique index number to keep track of the changes you make and to make sure you always use the right version of the Quote when making your business proposal or the right Invoice with the right quantity and price details when you are billing your Client. For example if your Quote and Job are structured into stages 1, 2, 3 and 4 and you wish to invoice your customer at each completed stage, then you will progress invoice for each separate stage, thus resulting with four Invoice reference numbers, for each of the four stages and they would look like XXXX.X.X.1, XXXX.X.X.2, XXXX.X.X.3 and XXXX.X.X.4. A brief summary list of all documents issued in reference to a project originating out of a particular Opportunity, you have listed into the bottom section of the Command menu, named Related. Each Invoice variation or version in JGID, once approved and confirmed as complete will be pushed to Xero or another integrated accounting software with a new entry number. This means that if you progress invoice for several items of a Job and at a later stage you progress the rest of the items, after the Job has been completed you will have two separate JGID index numbers for both these two invoices as well as two separate invoice numbers in your accounting software data base!